Detales sent me a pair of their grappling tights, and I tested them over two nogi training sessions (including a washing in between). I was also concerned about how all the exposed stitching would hold up between grappling and washing, but everything seems to still be in place. And all that designed stitching got several compliments from folks, too, so that’s a plus, as well. A solid pair of tights from Detales. Q5 Labs is a supplement company run by a grappler. I was sent a sample pack from Q5 Combat and asked to review it. Background on me: I’ve taken supplements of various kinds for the last 10 years or so. My dad has always been interested in health and fitness (I remember “health food cookies” as a kid; they tasted like sawdust with raisins mixed in. Not a fan. ), and even more recently he and my brother ran a supplement franchise, so I’ve had ready access to supplements and the industry for a while now. When I was asked to do a review of the products, the first thing that stood out to me was “Grass Fed Whey Protein.” At that point, I was very interested. I generally follow a Paleo/Primal diet, and one of the big tenets there is to use grass-fed (or, on their natural diet) products, including grass-fed dairy. But most, if not all, protein powders on the market are from corn-fed cows. Bad for the cows, bad for you. So, meh. But the Q5 protein powder is produced from New Zealand grass-fed cows. Also, most protein powders sold in the US are made from the cheapest protein powder possible and include many fillers to bulk it up even more and/or “improve” the flavor. (But all the extra stuff tastes terrible and generally does not mix well, leaving you with those nasty clumps that you have to swallow.) And that’s why I need 3 scoops (63g) of the cheap stuff to get 20g of protein. On the other hand, with a high-quality protein powder, just 1 scoop can net you more protein that that. One scoop (30g) of the Q5 whey protein is 21g of protein. And it mixes easily in minimal water & a shaker cup. Finally, taste. I’m not a fan of chugging down things that don’t taste good, whether or not they’re good for me. However, that wasn’t a problem — I tried both the chocolate and the vanilla, and they were neither overpowering nor chalky. Just enough taste so you could taste some flavor and so it wasn’t bland, but not too much to turn up your taste buds. Q5 has done all the right things with this protein powder. Launch Fuel is a pre-workout drink mix. It’s not a big amount to mix, and it mixes easily and is easy to drink. (Already we’re way ahead of most pre-workout products! Usually one taste, and that’s it. Bleh.) Also, no caffeine, so good for taking before evening classes. I had some before a Monday evening training session, which ended up including a whole lot of sparring. Now, I did take it almost right before class, so all the effects that I might have felt were occuring during the warmup, so I couldn’t distinguish between pre-workout drink fuzzies and general warming-up fuzzies. But, I did have a very good training session and, although I was tired by the end of the night, I still had the energy to keep going. Now, because I’m not sure what was pre-workout fuzzies and what was general warming-up fuzzies, I can’t say for sure how well the product worked. Pre-workouts are one of those things I need to test multiple times under multiple conditions so I know if the results are there. But, based on the initial test, Launch Fuel is a good contender for a pre-workout trial. And… these aren’t bad. Both were a little grainy after mixing in water, though that’s normal for these things, but not clumpy. Purple smells like beets (which I like) and tastes like strawberry/cranberry (I think it has none of those in there, lol, but that’s what I got from it). Green smells like instant apple-cinnamon oatmeal and tastes a bit, well, green (but not like grass, which most “green” mixes do). Now, I still wouldn’t want to drink them just because I’m thirsty, but these both are some of the best powdered fruit/vegetable mixes that I’ve had. So there you have it, a short review of a sample pack of supplements from Q5 Labs. I received the Manto Women’s “Sakura” Short-Sleeve Rashguard to review for martialartssupplies.com (BJJHQ). I reviewed a size Medium (women’s size). I’m 5’2″ and ~127 lbs. For another, the fit is great. The neck is high and fits just right (not too tight, not too loose). The sleeves are not restrictive on my shoulders or under my arms. The rest of the rashguard fits snugly and does not ride up. It’s a little longer than most of my other rashguards, but that of course only helps to keep it in place. I’ve worn it both nogi and gi, and it does not budge, not even when my gi top was loose and sliding around everywhere; the rashguard stayed where I put it. Several seams unraveled to some degree. A clip & a dab of clear nail polish fix those, but still a little annoying to pull it on and notice new loose threads. These are actually probably my fault as I insist on throwing all my rashguards in the washing machine and do not hand wash them as the directions say. But I do not understand why gear made for sweaty people has directions for hand washing. No sense it makes. It’s white. Not just white, but a thin see-through white. In the picture above, you can read the logo on the girl’s shorts through the rashguard. The effect is more obvious in person; it hides nothing. And, of course, this is obviously exacerbated as soon as you start sweating. I resorted to wearing a second rashguard underneath (uncomfortable, hot, and the bottom rashguard always ended up riding up & bunching, though again the Sakura stayed where I put it) or finally wearing it underneath my gi. I do not do jiu-jitsu for the wet t-shirt contest effect. Honestly, in my opinion the fact that it’s white and see-through is a deal-breaker. I repeat: I do not do jiu-jitsu for the wet t-shirt contest effect. I would like to see it in black/brown (the other color in the design), with the pink and white as the accents. I want to like it because it nails the look and function aspects, but the see-through design choice makes me pause every single time I pull it out of my drawer, and I have to think about what I’m going to wear under it. I shouldn’t have to worry about decency in my BJJ gear. As it is, it works well under a gi because it stays in place and is not restrictive. It would probably also work well during winter on those days when I wear two rashguards (yes, I do that when the academy is too cold). *For the record, the compliments occurred when I was wearing something underneath. 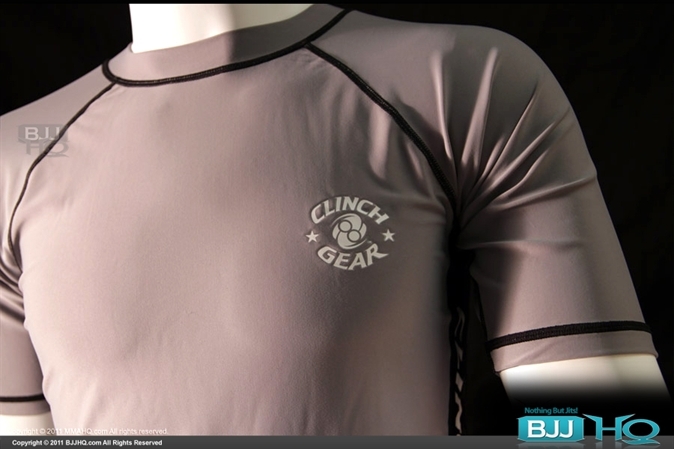 The Clinch Gear Performance Rash Guard in Silver was the BJJHQ Deal of the Day on June 21, 2011. Anyway, the rash guard arrived here in record time. It’s a size Small, seeing as how I’m also small: 5’2″ and ~125lbs. The Small fit me tight, without being baggy anywhere, whereas most company’s “small” is still too large for me. Sadly, I had another dumb moment in which I cut off the tag inside the shirt because it was tickling me. I didn’t save said tag, which of course had the fabric composition written on it. *le sigh* Well, it feels thicker than my normal rash guards, which are probably 100% polyester. (Yay, cheap Target shirts!) I worried at first about it being too hot but have found that not to be the case at all. 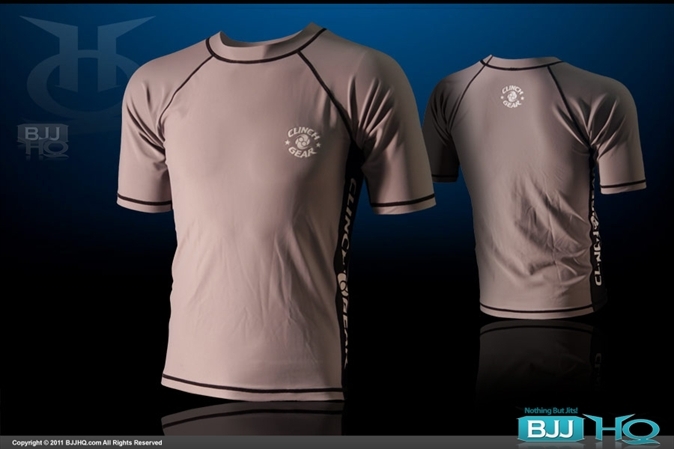 I’ve worn the shirt for both gi and nogi and have not noticed any problems in the overheating department; in fact, I think I do better in this rash guard than the cheapie ones. Most of my other rash guards — again being the cheap women’s workout ones from Wal-Mart and Target — have V-necks. This one has a regular neckline. Again, for the first few moments, my neck was confused, but it has since adjusted. Now I don’t even notice it. Overall impression: a very good rash guard. I find myself reaching for it over the cheapie ones now because it’s much more comfortable and stays on better. The Small fits tiny little me without riding up or bunching all around. Disclaimer: What’s in it for me? I got a free shirt that has turned in to my new favorite rashguard.